I wanted to share this beautiful card I received in the mail from Jamilla Ivits congratulating me on my promotion to Consultant! Of course, I have all of you to thank as I wouldn't be where I am without all of you! Thank you for your continued support! The card features some lovely Fall themed products and if you've followed my blog for any time, you'll know that Fall is my favourite season! 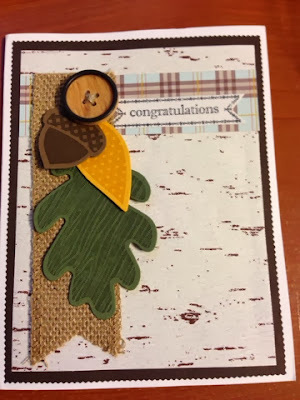 I adore how she used our Sweater Weather DSP to give the card that birch bark look. She then layered our Burlap ribbon with stamped and die cut images using the Autumn Accents Big Shot framelits (which are part of this week's Weekly Deals) and coordinating stamp set Wonderfall. This is a favourite from the FAll 2012 catalog that was carried over! Topped off with a sentiment from Itty Bitty Banners and matching framelits Bitty Banners, and a Naturals Designer button the card just feels like Fall; don't you think? To place your order for supplies to duplicate this, or any other project found on my blog, simply send me an email, call me at 289-280-0304 or shop my online store! Stephanie, Lovely blog, I have just come over to visit your blog from Stampin Connection and I am your most recent FOLLOWER. Hope you will come over and visit me on my blog and FOLLOW ME if you wish.